The Deep Blue NATO Diver is an unashamed “homage” to the Seiko SKX007 and SKX009. Our editor took the plunge and bought one to see how it compares to the classic dive watch: Are Deep Blue watches any good and is a Deep Blue NATO Diver better than a Seiko SKX007? The Seiko SKX007 (and its Pepsi-bezelled counterpart the SKX009) is one of the classic diver’s wristwatches. It was worn by Martin Sheen in Apocalypse Now, and as a result has fans all over the world. The Deep Blue NATO Diver is an unashamed homage to that watch, albeit with some key differences. The watch is presented in a nice, practical zip-up case with a hang tag and instructions. I went for a yellow model (which differentiates it nicely from the Seiko SKX series as they only have black dials) on a rubber strap. There are a range of strap options, including a NATO – which I bought separately as it was more cost-effective that way – and a bracelet, which is provided separately and costs more: you’ll have to attach it to your watch yourself if that’s the look you want. The Deep Blue NATO Diver is housed in a 44mm which is nice and chunky. It’s finished to a high standard, with a lovely engraved caseback. It’s bigger than the Seiko SKX007 which is just 42mm and so feels more modern. It has a better movement than the Seiko watch – it’s still powered by Seiko clockwork, but has a more accurate movement with hacking and hand winding. Having both day and date is a nice touch, and the bezel is beautifully knurled with a positive click. The 4 O’clock crown is also well machined and signed with the Deep Blue logo. There’s a helium escape valve to give it 300m water resistance (compared to the 200m of Seiko’s original watch). All in all, it feels like a far more expensive watch to the touch than the price might suggest. The dial is a stunning metallic sunburst yellow colour that looks amazing in natural daylight. The Deep Blue logo and other text is well printed and legible. In a change to the watch that inspired it, the Deep Blue NATO Diver has applied hour markers with a metallic border that is reminiscent of the Rolex Submariner. These, along with the deep chapter ring, give the dial a real sense of depth and quality. The lume, however, is very disappointing. It’s particularly noticeable when Seiko watches are renowned for their nuclear levels of luminescence and is one of the few areas where the watch falls short of expectations. 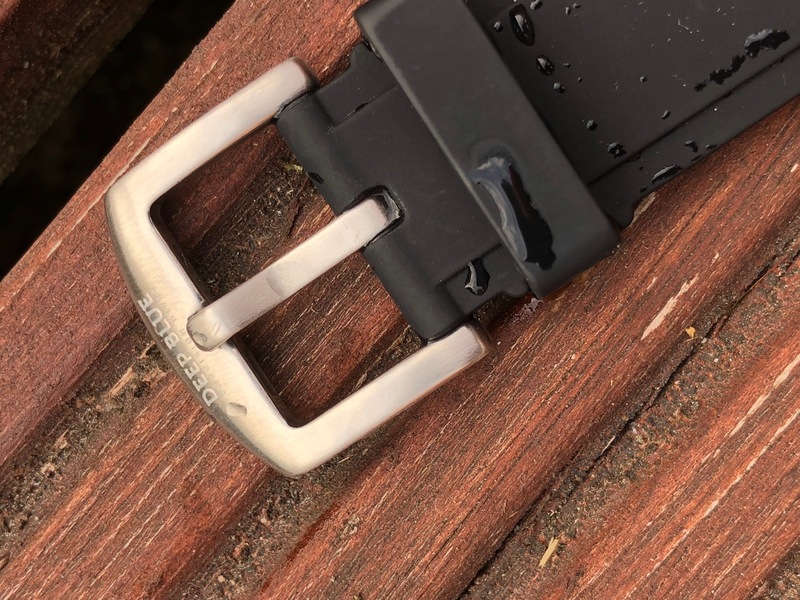 The strap I chose was the moulded rubber – I like my straps to meet the case without a gap, but the bracelet was too expensive on this watch and I read reviews that said that it doesn’t quite fit as well as it might. The rubber is comfortable, high-quality and matches the watch perfectly. I think it’s the best choice – even if you like the look of the NATO straps you can pick them up on eBay for less than a fiver and so you may as well get the best OEM strap for the price. The Deep Blue NATO Diver takes a 22mm watch strap if you are shopping for one. The buckle is, well, fine. It’s laser engraved with “Deep Blue” and it does the job. Overall, I love the Deep Blue NATO Diver. I handle a lot of watches, and this was one that inspired me enough to spend my own money on it. I elected for this watch rather than the Seiko SKX007 thanks to the build quality, dial depth and choice of colours. I think it will make a fine summer watch. Deep Blue sell watches from their own website. If you use the code “Deep” at checkout you will get 40% off the listed prices, which – even when you add the slightly high obligatory $50 international courier delivery costs – means that the watch on review cost me £155 all-in at today’s exchange rate. That compares favourably with the price of a Seiko SKX007 from Amazon. They don’t come up often, but you can sometimes buy a Deep Blue watch on eBay.